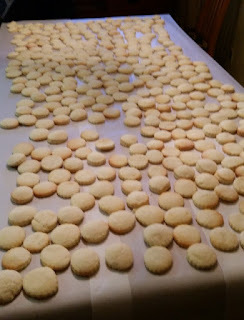 I recently made 6 times the recipe for a wedding event which gave over 700 cookies since it was one of the bride's favorite cookies and thought it would be a good Flashback Friday recipe. It is that time of year again where the home smells of sweet delights baking in the kitchen. If you like peppermint cookies, you can add 3 teaspoons of peppermint extract to make them peppermint cookies. Some cookies are just a sweet reminder of days gone by, and I have fond memories of these soft and delicately sweet cookies. Do you remember these when you were growing up? add into the egg mixture stir alternately with the sour cream. This dough is soft and should be in the fridge over night, so it can be rolled out easily the next day. When you roll out the dough, flour the counter and over the dough liberally because the dough is a bit sticky. Roll out dough on floured surface just over a 1/4" in thickness, into desired shapes. Bake at 350 F for 10-15 minutes watching carefully not to brown. They taste best looking whitish. You may choose to ice them when cooled with the following glaze. 2 cups icing sugar mixed with cream til it is a thick but spreadable constancy. The cookies look and sound great Charlotte. I really like that cup and saucer! I'm thinking the office employees will LOVE this one. I love to bake and send the food away after a little nibble. Love this cookies, have never made them before. Think I'll be trying this very soon. These cookies are wonderful! They certainly remind me of both my Grandmas. As small children, we called them Sprinkle Cookies, because Grandma tipped the iced cookie directly into a bowl of colourful sprinkles. So so yummy! I make them just like Grandma still does, with lots of sprinkles! I grew up with these, too. Now I make them for my kids. I make chocolate icing instead, and dip in coconut. Just like my grandma and my mom made them. :D I just have to remember not to roll so thin. They are best when thicker, too, and yes, not too brown. In large mixing bowl, soak gelatin in cold water until soft. Dissolve in boiling water. Add sugar and vanilla. Beat until thick and foamy. Spread on cookies and dip cookie into toasted coconut. (This amount replaces 1 bag marshmallows). They do look good and reminds me of a cookie my grandma made. Sorry for sounding like a nit-picker but approximately how thick should they be when rolled out? Chocolate icing and dipped in coconut sounds wonderful! Will be trying both. You are not being nit picky, that is a good question. Not thin like pie pastry, not thick like biscuits, does that help..:) I didn't think so. I looked on my ruler to give you my best guess. I would roll them out a bit thinker than a 1/4", but not much thinker than that. I will amend the recipe and add that to the method. Thanks for asking. can these be drop cookies---no rolling? looks like the peppermint cookies my Oma made. These cookies are delicious. However, I had a lot of trouble rolling them out - way sticky. Perhaps it's b/c I used whipping cream and they would 'work' better with sour cream. I ended up dropping at least half of them and they turned out much better, shape-wise. 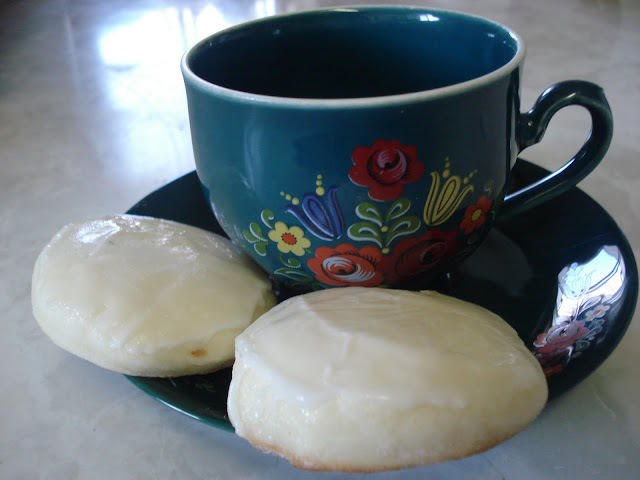 AngAK-My Mom made these as drop cookies when I was growing up. There desperately needs to be a gluten free version of these. I miss them so much!! Thanks so much. Since I, too, am in BC I will look for it! My mom is GF and I just replace the regular flour with a GF mix, it works wonderfully and she LOVES them. Wow Charlotte - you've touched nostalgic hearts with this one - they look terrific. I remember my Grandma Fehr making these...absolutely yummy! I hope this works for you I have not made this myself but think that it's time to give it a try. stir gelatin mixture, vanilla and salt into sugar water mixture. Beat on high till mixture thickens (15-20 min). Spread on cookies and dip in coconut. I know it's been a long tome, and probably the recipe above is the white marshmallow frosting you were looking for. However, when I first read your description, I said to myself "Seven-Minute Frosting!" I used to make it for my kids' birthday cakes, and is is very glossy white and very marshmallow-ey. Simple, too -- only 4 ingredients. Google "7-minute frosting." This recipe has been in our family for over 100 years. Another variation is to use whole buttermilk and instead of iciing, I sometimes make a gelatin (marshmallow as my family calls it) topping sprinkled with colored coconut. Are you Tina Fehr from SK? Because if so, I know you. Oh. My. Goodness. Your posts make me drool. Seriously! These look SO GOOD! 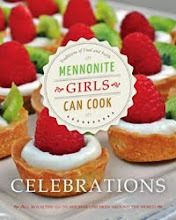 I can't wait to try all the recipes on your blog! I think the icing gives it a bit more flavor, and I like all the suggestion with the chocolate, coconut and sprinkles too. OH yummy, I'm going to make these for my family!!! If I can recall, it is approximately 6 or 7 dozen. Oh wow do these bring me back a long ways. This Christmas I decided to add some mint in the glaze...delicious! I think I like this recipe better than my mom's - because of the amount of baking powder. They were great. This recipe makes 6 dozen. Sounds wonderful - just a couple questions. Do I put the peppermint in the cookie batter or the icing? And what is baking ammonia? Is it an alternative to baking powder? These are wonderful plain, soft white cookies, but if you wish to make peppermint cookies, yes, the baking ammmonia replaces baking powder and peppermint oil goes in the batter. You can check out hte recipe for peppermint cookies. Oh those must be good if it's Oma's recipe!!! Tis the season for cookies!!! Yes,, how much ammonia and peppermint do you put in?? I think my MoM used both... not sure though. 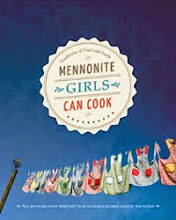 I have always loved anything made by Mennonites! These are very interesting looking and I'm going to try them. The old recipes are the best. When using whipping cream, do I whip it first or just use it in liquid form? The Whip cream in liquid form. This recipe is very similar to the family recipe my husband's family brought out of Russia when the immigrated here to the US. We use 2 Tablespoons (25 cents worth according to the original recipe)baking ammonia dissolved in hot water and 1/2 teaspoon baking powder. The recipe we use also calls for 1/2 teaspoon peppermint extract in the dough. I have never used less than 6 1/2 cups of flour to get the right consistency to roll, and the recipe makes 13 dozen. We make them at Christmas, and they are Santa's Favorite according to my children. Baking ammonia can be purchased online from King Arthur Flour or on Amazon if you cannot find it locally. 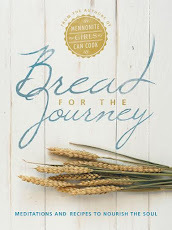 I started using gluten free flour in place of the regular flour after our daughter developed a gluten allergy, and no one noticed a difference in taste.